UVs Animator is a small tool for 3ds max. It can create and mix simple UVs animations that would be hard to make by hand. Here are some example to demonstrate what you can achieve. 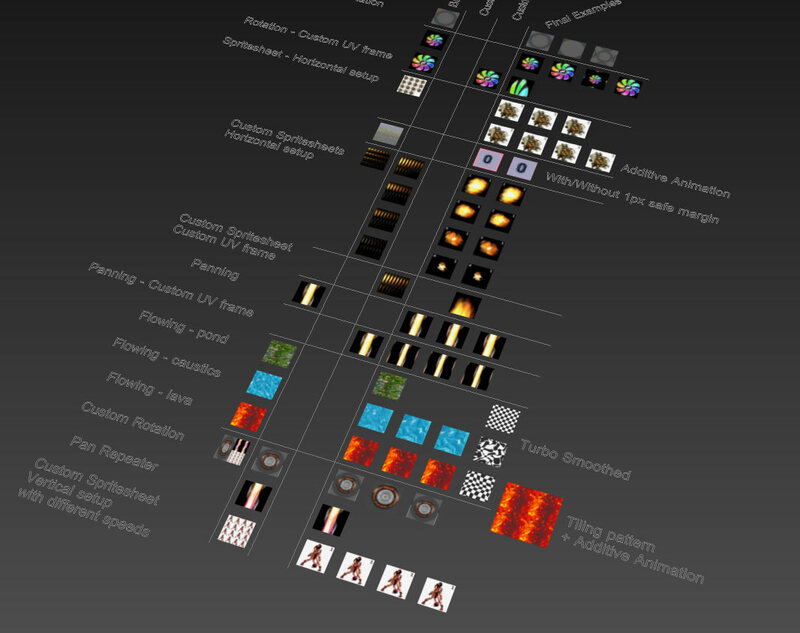 You need 3ds max 2010 (and after). If you have any problem opening the files, please leave a comment here. This tool adds an Unwrap_UVW modifier and animate UVs inside it. So only UVs are animated and nothing else (geometry/materials are untouched). To deactivate the animation, just turn off/delete the modifier. Collapsing the modifier in the stack will also remove the animation. A good practice would be to weld every vertices before animating. Select one Edit_Poly object and assign a material so you can see a texture. It should work with any material as long as UVs coordinates are taken into account. 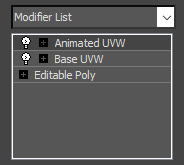 When your Edit_Poly object is selected (1), open the UVs Animator UI (2). For basic animations, that’s all you need. 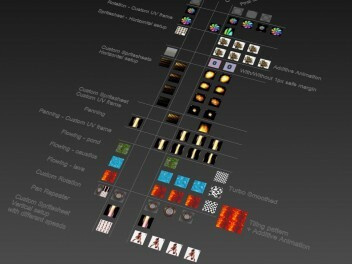 What’s important to remember is that every animation will be set inside the UVs Area. The UVs Area is the small orange gizmo thing inside the UVW Unrwap modifier. Not the red faces or the vertices, but the orange gizmo surrounding everything else ! Now you’re ready to launch UVs Animator and play with the different settings ! 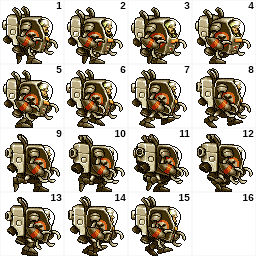 The spritesheet mode allow to create some spritesheet animation. You can specify the area where the animation lies on the texture (see advanced use). 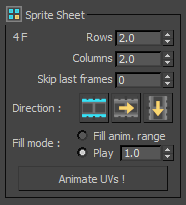 You can define a 2nd frame on the timeline if you want to use a different UV shape than the one used to define the spritesheet area. 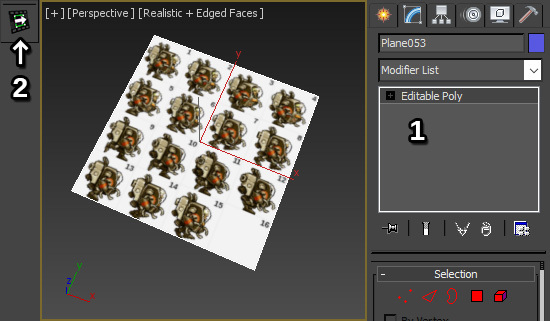 Place the UVs on the first frame of the spritesheet, but on the 2nd of the timeline (please read this 2 times). The rotation animation mode allow to create a rotating motion (like fans or wheels…). It will create one UV shape for each frame to match the animation duration. This happens because UVs interpolation works on a per-vertex basis so there’s no other choice than creating a key for each frame. You can define a 2nd frame on the timeline if you want to use a different UV shape than the one used to define the rotation area. The panning mode may look like it’s useless since you already can achieve some panning motion using the default interpolation in 3ds max, but hey, i’m a lazy person and I like one-button magic ! Actually, it comes in very handy when used in combination with Additive Anim (see advanced use). Units : when using %, movement is relative to UVs Area size or texture size. When using px be sure to set the right texture size in the Safe Margin settings. Relative to UVs Area size : when using %, relative to UVs Area size or texture size. 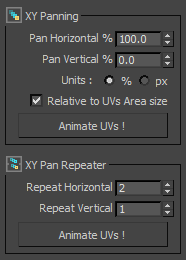 If you want the animation to loop, pan with a multiple of 100% and it’s better to uncheck Relative to UVs Area size. You can define a 2nd frame on the timeline if you want to use a different UV shape than the one used to define the panning area. The repeater is a special animation mode. It is useful to keep your UVs within a certain range like when using clamp mode for UVs overflow or if you’re only using part of a texture. Basic usage is like so : create a panning animation of 100% in each direction. Then, change the repeat values to something like 2 and 3 and apply. Open the Unwrap modifier created and have a look at the UVs while moving the time slider. Motion is created on a per-vertex basis, so to keep your UVs in one piece, you should weld all vertices. 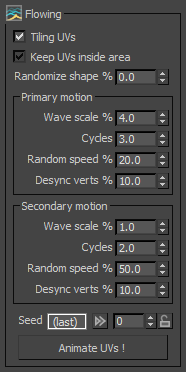 Desync verts : motion is created on a per-vertex basis and by default all waves are synchronized. Use this to desynchronize waves. Seed : this is the random seed used to generate motion. If the motion doesn’t fit your need, just ctrl+z (or delete the modifier) and Animate UVs again until the motion fits your liking. If you want to use the same seed each time, just lock it. You may also re-use the last one by clicking on the small arrows (or copy-paste). This is used if you want to mix multiple UVs animations. Just check Use additive anim to add an already created UVs animation to the one you’re about to add. 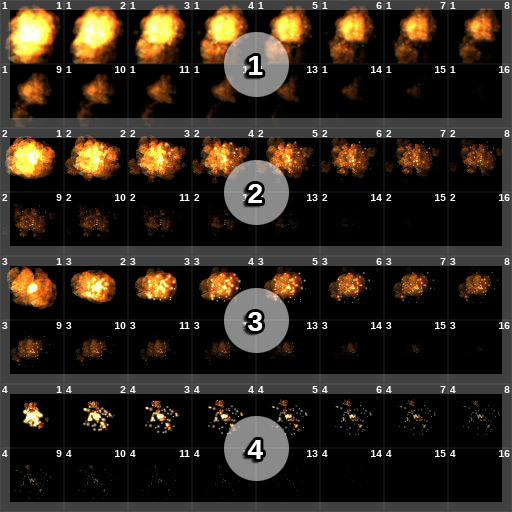 Note : If you’re using additive animation, you should apply the safe margin only on the last animation you will add. By default, the animation is created to fill the timeline (may not be true for Spritesheet – see fill parameters). So if your timeline is set from 0 to 300, the animation will be 300 frames long (in 3ds 1st and last frame should be the “same” for looping mode), but you can choose to use a custom one. The Match range to custom button will simply set the timeline to the new animation range you’ve set. You may add a turbo smooth modifier on top of the animation. You can still use the additive mode ! Select the object, open the curve editor and expand the Animated UVW modifier. Select all keys and set tangents to stepped. That’s all ! The UVs Area is the surrounding rectangle of the UVs. But what if you want more control ? That’s possible. You need a second frame in the Unwrap_UVW modifier. Turn autokey mode on (dont forget !! Even when modifying the first frame !!) and go to the 2nd frame of your animation. Then just edit the UVs, and turn autokey off when you’re done. Feature request : feel free to ask ! Also, if you find any bug, just comment here or in the polycount thread. Je ne crois pas mes yeux. Grace à ça, il sera possible de faire des animations en clin d’oeil! En plus l’interface rend tout possible. Chapeau!! !